So, you’re planning to visit Rome during your next trip to Italy? With your lover or family, Rome is the perfect place to spend a 2-3 days weekend, especially since the city can be easily visited on foot! 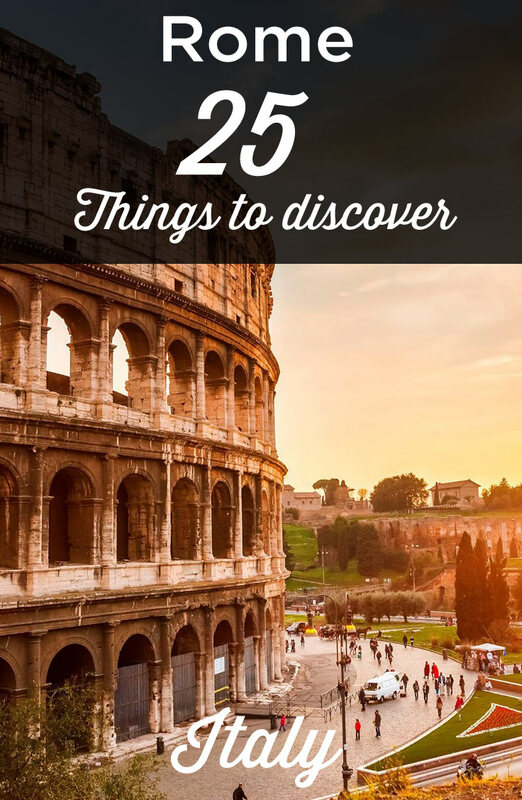 In order to help you plan your stay, I have written this guide of the best things to do in Rome, with all the must-see attractions and points of interest. At the end of the article, you will also find itineraries to visit Rome in 1, 2 or 3 days (or more!) as well as my suggestions of the best accommodations depending on your budget. So, what are the best places to visit in Rome? Let’s find out! 21. Where to eat in Rome: Have lunch in a trattoria! How many days to visit Rome? How to go to Rome? 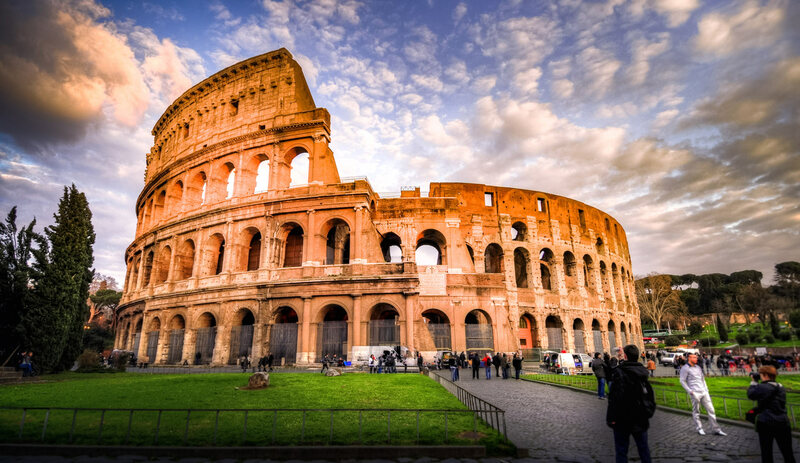 Lets start this list of the must-see attractions with the Colosseum, located in the Historic Center (“Centro Storico” in Italian). It’s the most emblematic monument to visit in Rome! With a capacity of more than 50,000 spectators, it’s the largest amphitheater in the Roman world. Quite much blood was shed in these arenas, where the famous gladiatorial combats, animals fights and Roman games were held, always followed by horrific deaths. The visit isn’t free and you will probably have to wait for a few hours before getting there if you are going in high season. Buy skip the line tickets for the Colosseum, with or without guided visit. You need to buy them here. 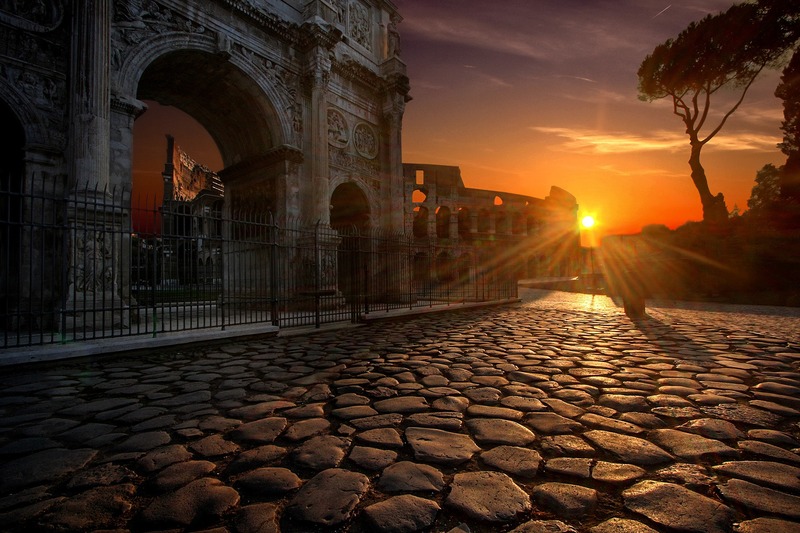 Purchase the Rome City Pass (click here), an all access pass with no time limit and free skip the line entrances to the most famous touristic sites of Rome and Vatican. (Colosseum is of course included). You also get rebates of 20% or more on other activities. And you know the best about this pass? It also include a free 1 way airport transfert and a free audio guide. It’s new and it offers an amazing value for money! 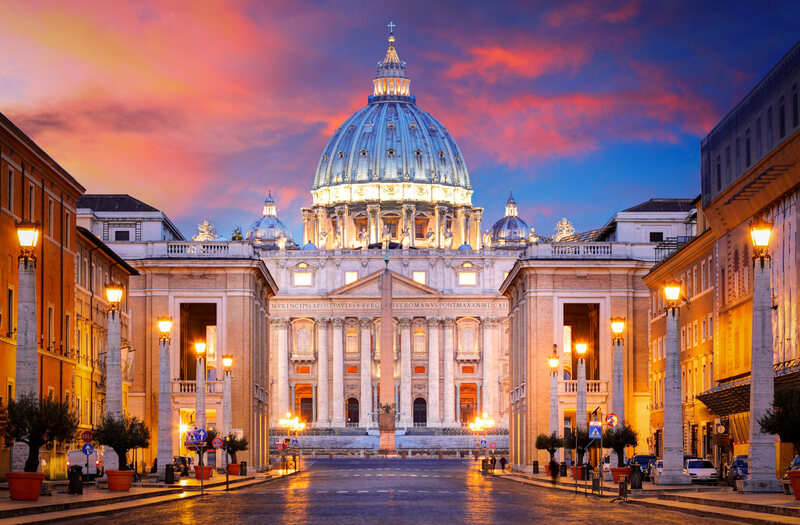 Buy the Vatican & Rome City Pass (Omnia Card) – click here: it’s the most complete pass to visit Rome. You will get rebates on more than 40 attractions + free public transport. The ticket purchased at the Colosseum also includes access to the Roman Forum and the Palatine Hill (I will talk about it just below), so it would be a shame to miss them, as the 3 touristic sites are linked together. The forum was the centre of the city and you can see ruins of ancient markets, administrative and religious buildings. However, you will not find any explanation on the site, so if you’re interested in history, you should really opt for a guided tour. This is the third point of interest included in the Colosseum ticket. Palatine Hill, one of the 7 hills of Rome, is according to mythology the place where the city was founded by Romulus and Remus. As you might know, they are the two twins who would have been found and suckled by a wolf in a cave. At the top of Palatine Hill, you will have access to this cave and ruins of the residences of historical figures such as Augustus, the first Roman emperor. Not far from the Roman Forum, at the other end of Via dei fori impierali, you can find piazza Venezia, one of Rome’s main squares. 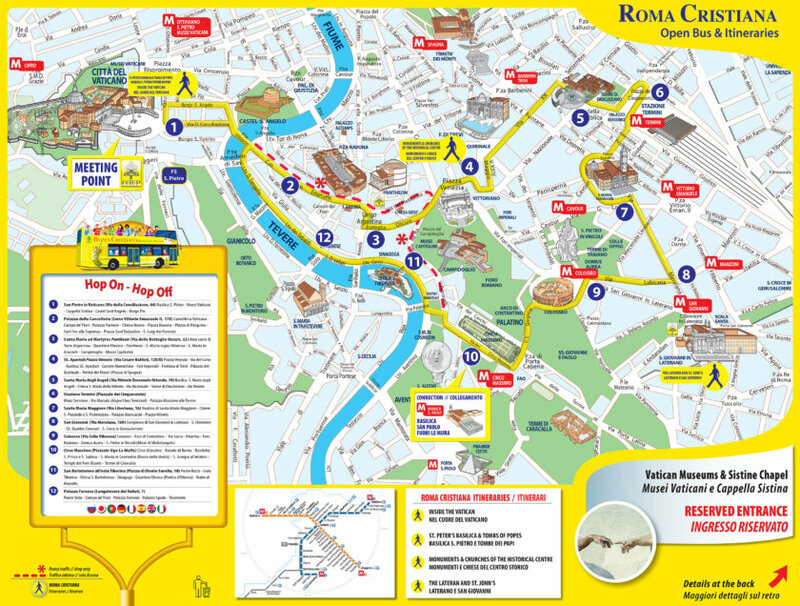 From there, all the streets leads to Rome’s main tourist attractions! 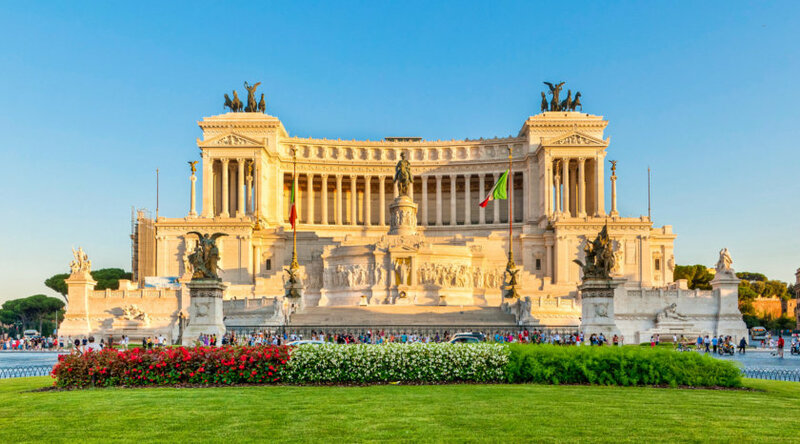 This is where you can admire the Monument to Victor Emmanuel II, also called “Altare della Patria” or “Vittoriano”, a huge white marble building dedicated to the first king of Italy, Victor Emmanuel II. Next to the square, there is also the famous Trajan’s column, with bas-reliefs retracing the military conquests of the Emperor Trajan. Palazzo Nuovo or New Palace, which now houses the Capitoline Museums and the Museum of Art and Archaeology. One of the most famous art piece you can find there is the Capitoline Wolf statue: The one with the mythical she-wolf suckling Romulus and Remus. You may have already seen it, it’s in almost all history books! Don’t forget to buy your tickets in advance here. 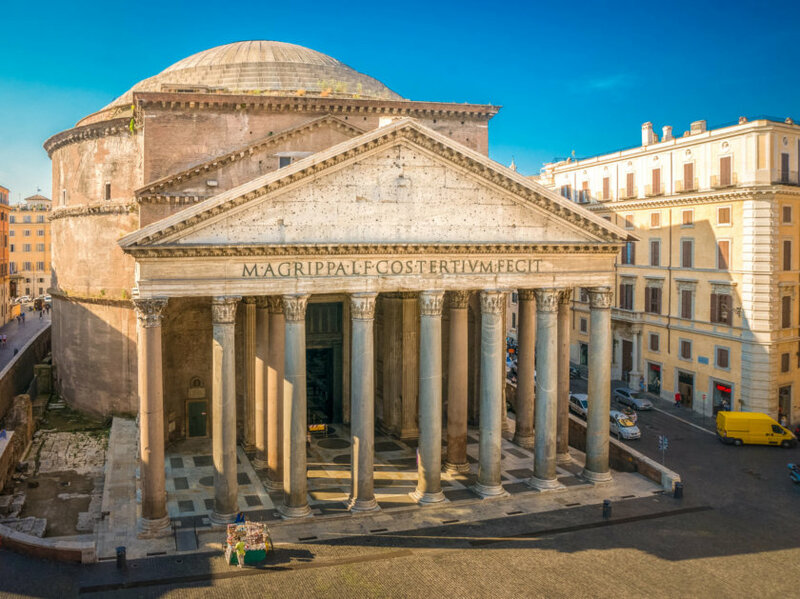 The Pantheon is the best preserved ancient building in Rome and another must-see touristic attraction to add to this list! Originally dedicated to all mythology divinities, it became a Christian church in the 7th century. Don’t hesitate to enter, the visit is free of charge, which is rare enough to mention it! Inside, admire the immense dome and the oculus (the opening in the dome), giving the place a unique lighting. And if you want to get more historical information, you should get an audioguide. It can be booked here. It’s a great place to have a drink or eat ice cream on one of the many terraces, but beware, since this place is very touristic, the prices are too! Also close to the Pantheon, you’ll find the most famous fountain of Europe: The Trevi Fountain (Fontana di Trevi in Italian). A must see for anyone visiting Rome. Because of the legend surrounding it, this fountain is also renowned for hosting a large number of wedding proposals! Legend has it that in order to save her virginity, a young girl had to reveal the location of the source to the Romans. In the basin, there are numerous statues representing an allegory of the sea, with Neptune on his chariot in the center. The tradition says you should throw 2 coins: one to make a wish and the other one to be sure to return to Rome. Behind the fountain, a large baroque palace contributes much to the charm of the place. Just one thing: the place is always crowded, so you will have a lot of trouble to make a perfect photo of the fountain with no unwanted heads! 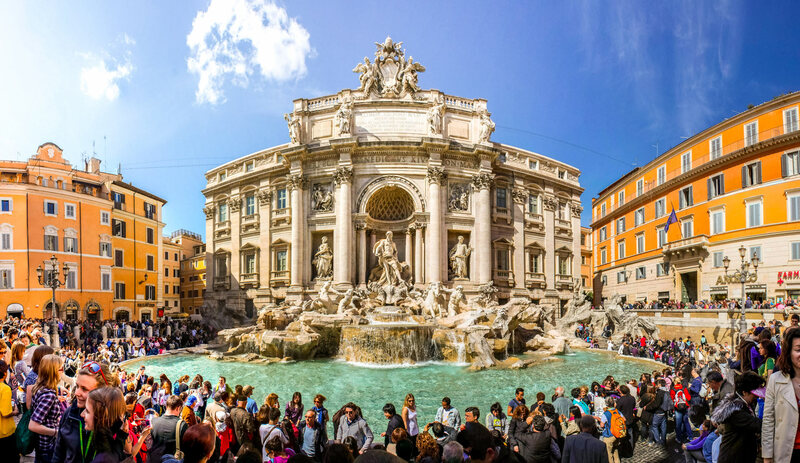 Nevertheless, the Trevi Fountain is a major point of interest in Rome. After Trevi fountain, to recover from your emotions (if you were proposed or if you knelt down on your knees while sweating with stress!) or simply to take a short break during the day, it’s time to enjoy an ice cream. The great new is that you’re in the ideal place, very close to one of the 2 best ice cream shops of Rome: San Crispino located on the Via della Panatteria. The queue is often impressive, but the best things in life are the hardest to obtain! And since opinions often differ on THE best ice cream in Rome, I also give you the name of San Crispino’s direct competitor, the gelateria “Giolliti” located in Via Uffici del Vicario. Whichever you choose, you will face the same problem of long waiting line and multiple choice of perfume dilemma. And yes, as you know from my articles on Nice or Annecy, I am a big ice cream fan! So I have a pro advice to give you: test both! It’s the best way to make up your own mind, isn’t it? If you want to do some shopping in Rome, it’s the right moment: You’re close to the 2 main shopping streets. Go to Via del Corso to do some shopping at reasonable prices with big brands such as Zara or H&M. If you have a higher budget or just want to admire the shop windows, continue your way on Via Condotti. It’s the most prestigious street of Rome with brands like Gucci, Armani or Prada. A bit like the Champs Elysée in Paris! 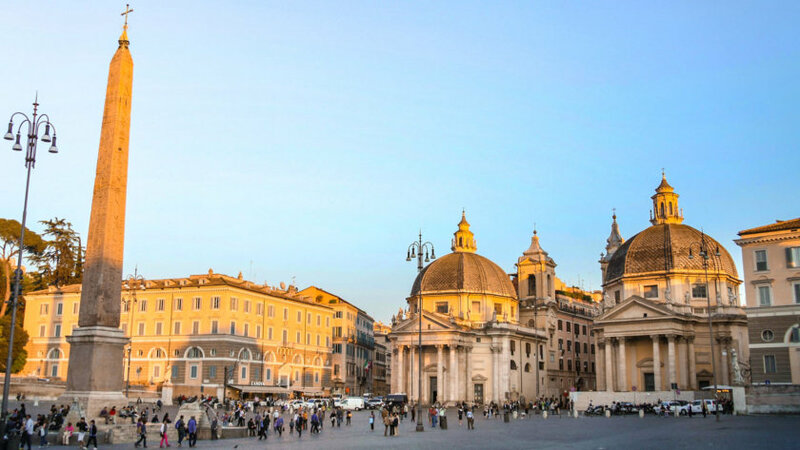 The Via Condotti will take you straight to the charming Piazza di Spagna, certainly one of the most popular squares, thanks to the beautiful perspective it offers. 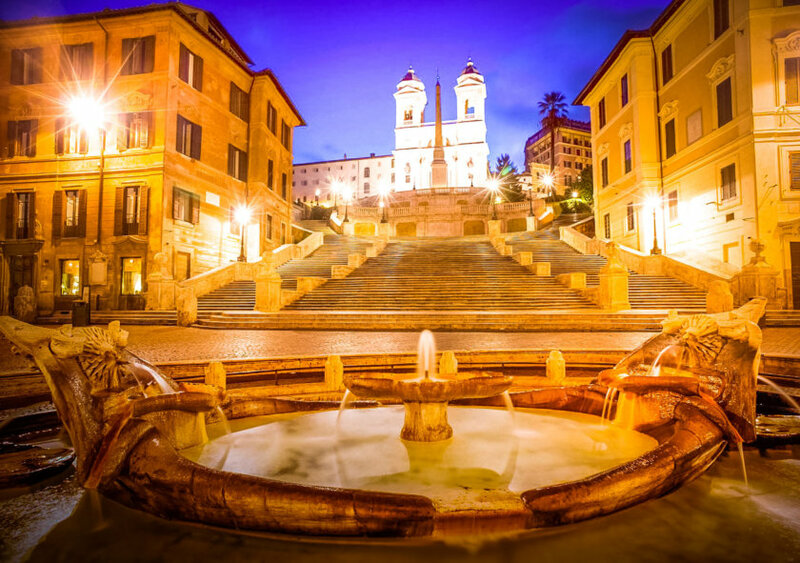 The Piazza di Spagna is located at the foot of the monumental staircase leading it to the Trinità dei Monti church. The flowery staircase is the perfect place to take a short break for tourists and Italians alike. A popular gathering place! On the square, you can also see the Barcaccia fountain ,which adds to the charm of the place. As I was saying, at the top of the Piazza di Spagna stairs, there is the Trinità dei Monti church which offers a breathtaking view of the city. Its location makes it one of the most famous churches in Rome. Did you knew that the city has no less than 900? 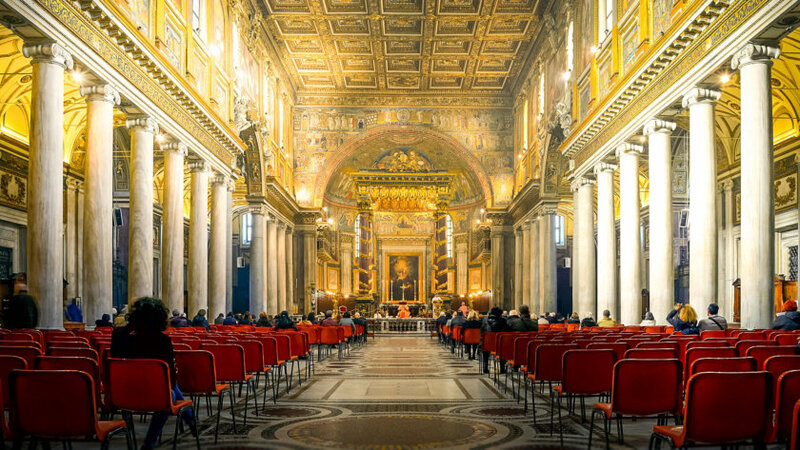 Here is a list of the most beautiful churches in Rome, some of them are true architecture masterpieces! The Basilica di San Paolo Fuori le Mura, which marks the location of St. Paul’s tomb. North of Piazza di Spagna, there is the largest and certainly the most beautiful public park in Rome. 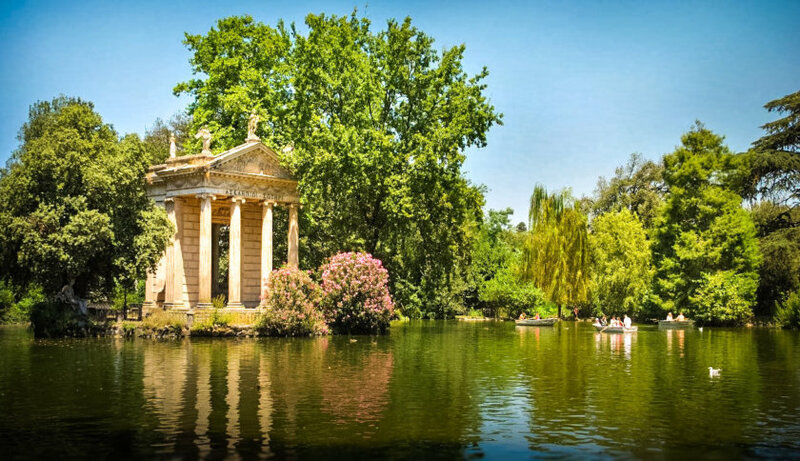 The Villa Borghese gardens offers a bit of very welcomed calm, after the crowded streets and tourist attractions! You will be able to walk in the wide shady alleys and at the edge of a lake surrounded by temples, statues and many fountains. The park also has a beautiful botanical garden. To get there, go to Porta Pinciana or Piazzale Flaminio, the 2 park entrances. 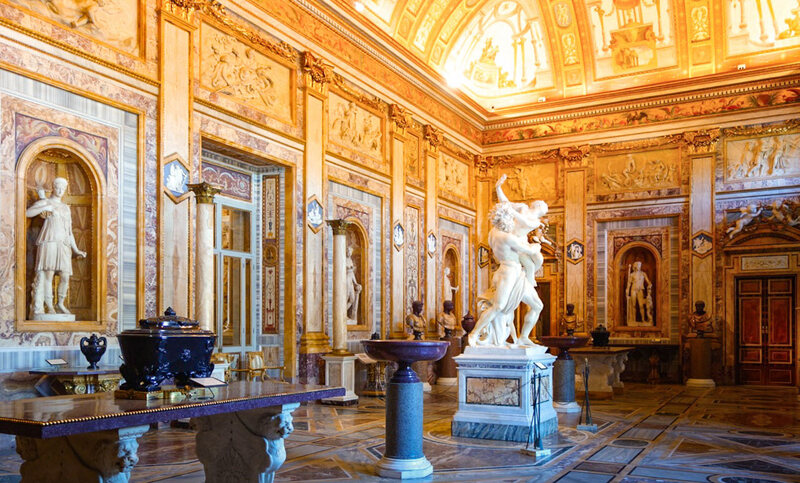 The galleria Borghese that contains a collection of paintings and sculptures. Get your “skip the line” tickets here! The Vatican museums: more than 13 museums grouped together in a huge architectural ensemble of nearly 7 kilometers long! Several possible routes ranging from 1h30 to 5 hours of visit. But don’t worry, all routes end at the very famous Sistine Chapel. To have more time to enjoy the visits, I highly recommand you to buy the skip the line tickets in advance. You will save a lot of time! Grab them here now. Galleria Nazionale d’Arte Antica or National Gallery of Ancient Art, with a collection of Italian and European paintings. You should go there to admire the works of Raphael or Caravaggio. The Piazza del Popolo or People’s Square is located near Villa Borghese. It’s one of the largest squares of Rome. It’s a major point of interest, with its fountains, 3 churches and obelisk. From the square, climb the stairs to the top of the hill, you will have a beautiful view up to the Vatican. From the piazza, you can then follow the Tiber to the Sant’Angelo bridge and the castle of the same name located on the opposite bank. The bridge is decorated with 10 statues representing angels, all designed by Bernini. From the bridge, you will have a magnificent view of the city and the river. The Castel Sant’Angelo, on the other hand, was built by Emperor Hadrian to serve as a mausoleum. Later on, it started to play an important military role: it even served as a place of refuge for the popes during invasions! They have even created a direct access to the Vatican. You can visit the castle, see the tombs and the ancient popes apartments. You shouldn’t miss the great view from the rampart walk. Don’t waste your time waiting and buy the skip the line tickets in advance here. A long corridor leads from the Castel Sant’Angelo to the Vatican. 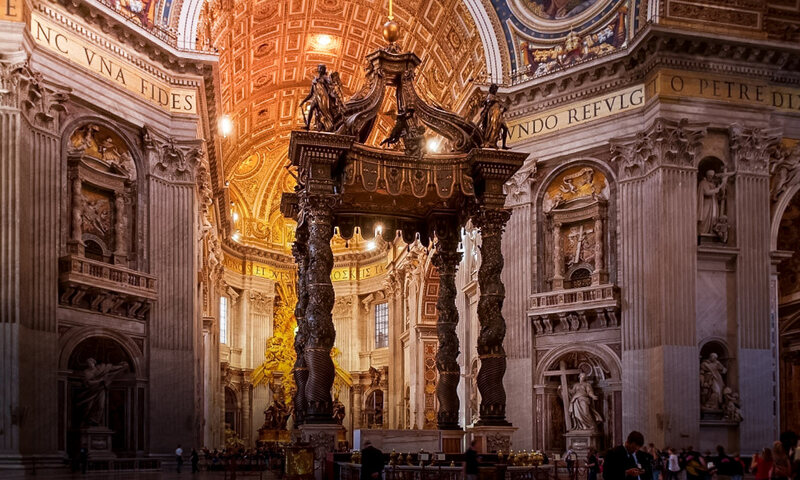 Even if you’re not a believer, a visit to the Vatican is a must during a stay in Rome. It’s the smallest country in the world, yet is one of the most visited places during a tour in Italy. Only priests and nuns, some dignitaries, guards, and of course the pope are allowed to live there. A little fact about the guards: they are only Swiss and must of course be Catholic. They swear an oath of fidelity to the Pope himself. This tradition goes back to the sack of Rome in 1527, when the Swiss guards protected the pope during his escape to the Sant’Angelo castle. 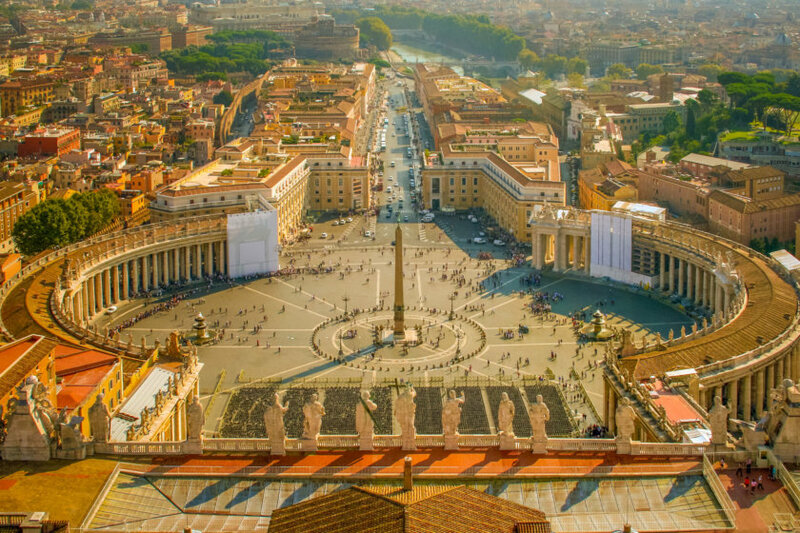 You will enter the Vatican through the famous St. Peter’s Square (Piazza San Pietro in Italian). Every year, millions of pilgrims and tourists comes to see this square! St. Peter’s Square was designed with the following principle in mind: they wanted to allow the greatest number of people to see the Pope give his blessing from the balcony of St. Peter’s Basilica. Two colonnades surround the square, consisting of nearly 280 columns and 145 saints statues. In the center of St. Peter’s Square stands an Egyptian obelisk surrounded by 2 large fountains. The long waiting lines to visit the basilica start from this square. The gigantic dome designed by Michelangelo. On the right side of the basilica, you can access the dome. You need to take an elevator first, and then, the hardest thing, to climb 323 extra steps. It’s not recommended for claustrophobes, the ceiling is low and the corridors narrow, but your effort will be greatly rewarded by the magnificent view of the city of Rome. The entrance to St. Peter’s Basilica is free of charge, you will just be searched at the entrance. Access to the dome has a fee. This neighbourhood is becoming more and more trendy and a little “Hipster”, but for now it has retained all its original charm. You will be (relatively) away from the crowd to discover its typical narrow and flowery streets. There is no big historical monument here like in the rest of Rome, but a real “Italian” neighborhood with its inhabitants and local shops. I personally visited Trastevere in October, but it seems many tourists visit the area in high season and it becomes less quiet! On your way to the north of the district, go up the Gianicolo hill to admire a beautiful panorama of the city. 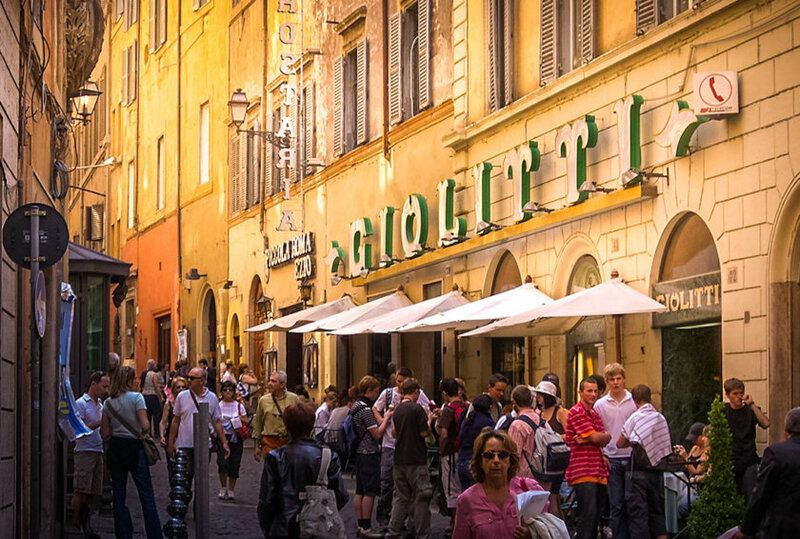 The Trastevere district is also the ideal place to enjoy pizza or good pasta in a traditional trattoria. There are a lot of authentic local restaurants with nice small terraces and without too many tourists, it’s the perfect match! Roma Sparita: Big terrace, traditional Roman cuisine. Don’t miss the speciality of the restaurant: the “cacio e pepe” spaghetti with pecorino cheese and pepper served in a cheese shell. This is my favorite for its great value for money. Requires reservation. Antico Arco: Excellent dishes (especially the risotto) and a very good wine list. Bonus: they bring you a sample of your partner’s dish in a small plate so you can taste it. Tonnarello: Typical, excellent cuisine on a very pleasant setting. Generous dishes at affordable prices. Birra e sale: Located next to Piazza Navona. Sandwiches are delicious and made with fresh products. You should definitely try the cold cuts and cheeses! Pizzeria Loffredo: Very good pizzas and fresh pasta. Great selection of dishes. Friendly atmosphere and very welcoming staff. Booking strongly recommended. Perfect price / quality! Il Tamburello di Pulcinella: little family restaurant with food made by the mama. Pizzas, pastas, desserts, all home made for a reasonable price. Booking recommended. Since I’ve made your mouth water with Italian cuisine, let’s keep going! 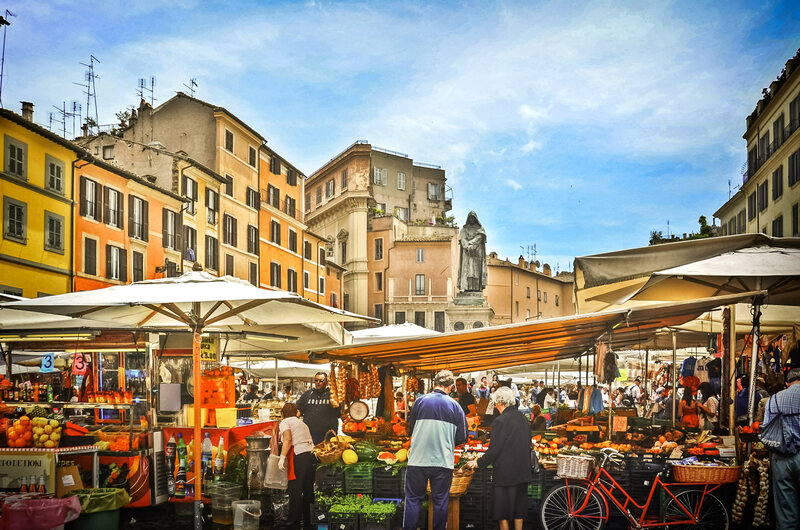 To enjoy the smell of fresh produce and admire their bright colors, I advise you to take a little walk through the campo di Fiori. Every morning (except Sunday) there is a fruit, vegetable, meat and fish market. Although appreciated by tourists because it’s located in Rome historical centre, this small market has managed to preserve all its authenticity. it’s the perfect place if you want to bring home high quality products from Italy. It’s much cheaper than in Rome touristic areas! Like Trastevere district, the San Lorenzo district is less known to tourist and clearly worth a look. Originally a working-class district, it’s nowadays the student district, with Roman universities. In addition to students, it’s also the street artists favorite place. And for amateurs, the nightlife is great and beer isn’t expensive at all! A peaceful neighborhood, beautiful gardens and an incomparable view of the city, this is what the Aventine Hill (“Aventino” in Italian) has to offer! The famous Aventine Keyhole, located Piazza dei Cavalieri di Malta. You will see people standing in line to look through the keyhole (I won’t say anything more!). I will finish this list of the best things to do in Rome with an unusual activity: visiting the catacombs. I recommand you the Catacombs of Callixtus, the best to visit in my opinion! Once used as cemeteries for Jews and Christians, they are the largest in the city and cover almost 15 hectares. On the walls, you can see representations of Christian life such as baptism and scenes from the Old and New Testaments. The visit of Rome catacombs takes about 30 minutes and must be done with a guide. 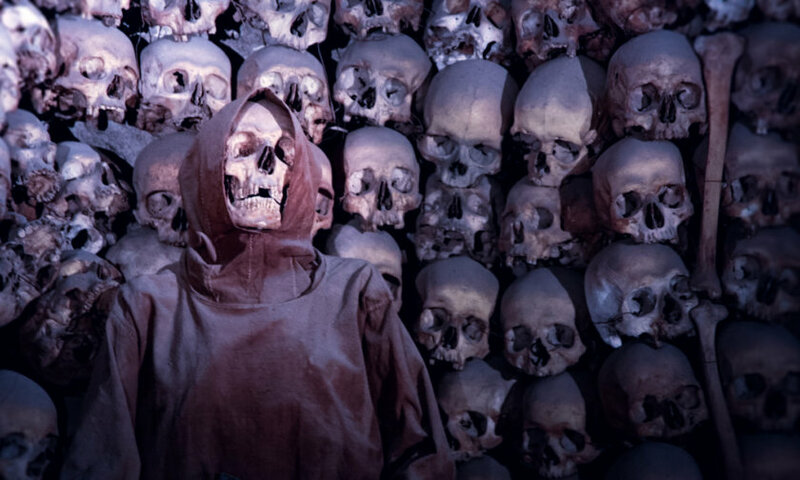 If you want to visit Rome’s catacombs during your stay, the easiest is probably to go to the Capuchin Crypt, as it’s located downtown, next to the Trevi Fountain. You should book the tickets for the tour here (the guide is included). Other catacombs such as San Sebastian, Domitilla or Catacomb of Priscilla can also be visited. If it starts to rain during your stay in Rome and you don’t really know what to do, no need to worry! Visit Rome’s museums: considering the number of museums in town, it can for sure keep you busy for a few days, especially if you go to the Vatican museums and Sistine Chapel. Going to the Pantheon: you may not know it, but when it’s raining in Rome, it’s actually raining inside the Pantheon! The central oculus is just a hole, so the rains falls through it. Inside, the ground has a slight slope and a few holes, allowing the water to drain away. Discover (and probably purchase!) amazing local products at Eataly, an indoor market entirely dedicated to Italian gastronomy. The hardest thing will be not to overload your luggage! Discover the catacombs, an unusual visit to do in Rome when it rains. Take an Italian cooking class, to learn how to make pasta or pizza like a pro! Go to one of the indoor karting race tracks: Beyond Roma, Karting Roma, Holykartroma. Go play bowling: the Bowling Roma is the closest from the city center – Address: 181 viale Regina Margherita. Here is my selection of the best things to do in Rome at night, or in the evening. Visit the Colosseum at night, VIP style. Yes! You can visit the Colosseum + its underground with a guide after it closes for the general public. The ambiance is totally different, it’s the most exclusive way to discover this marvel of Ancient Roman civilization. You need to purchase your tickets in advance here. Discover Rome Catacombs at night: An even better way to discover the catacombs is at night, with this VIP tour. You have to book it here. Visit Rome by night in Segway. This 3 hours guided tour in Segway is a lot of fun! It needs to be booked there. 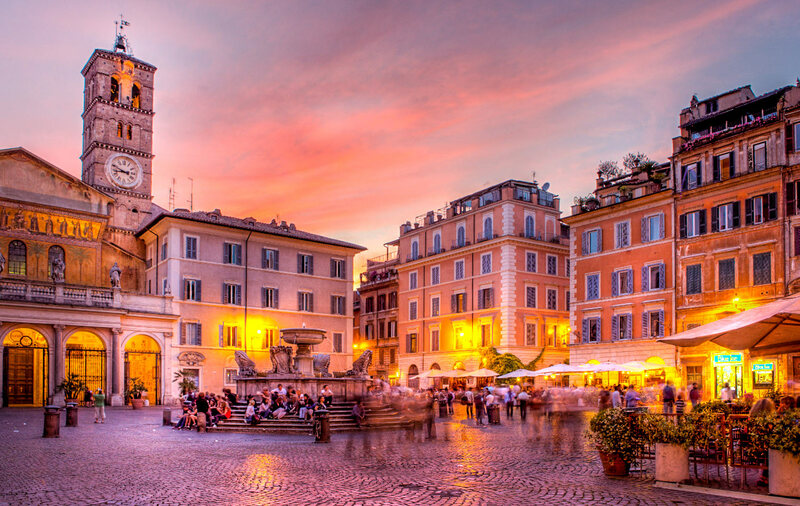 Go have a drink in the Trastevere district, for sure the best place to enjoy Rome’s nightlife. Simply walk around and discover the illuminated squares and monuments: Rome is extremely beautiful at night. Visit the Colosseum of course! The monument might not be what will captivate them the most, but the stories about gladiators and wild beasts will for sure catch their interest. Go to Villa Borghese park for a family picnic and enjoy the greenery. There are several children playgrounds, you can rent a bike and you can even rent rowing boats. Take your kids to the Gladiator school! This activity is a very fun way to learn more about gladiators, the whole family will love it! It must be booked in advance here. Discover Explora, a museum designed especially for kids, with many interactive activities. And for the last one, something I suggest you NOT to do: the “Time Elevator”, a virtual reality 5D movie to discover Rome. The problem is that it’s actually pretty old and bad, so you should save your money and do something else! (who said buy more ice creams?😋). Here is a one day itinerary to visit Rome on foot. It will allow you to discover most of the city’s main tourist attractions. If you choose to do it in 1 day, you will have to content yourself with seeing the monuments from the outside only. If you spend more time in Rome, you can split this walk on a few days: I will show you to the best way to do it a bit further down in this guide, in my itineraries to visit Rome in 2, 3, 4, or 5 days. let’s start this walking tour at the Colosseum, to admire its impressive architecture. Then, head to Palatine Hill and the Roman Forum, the 2 other touristic sites in the Ancient Rome area. To continue this walk, let’s go to the piazza del Campidoglio and then piazza Venezia, where you can enjoy the beautiful Monument to Victor Emmanuel II. 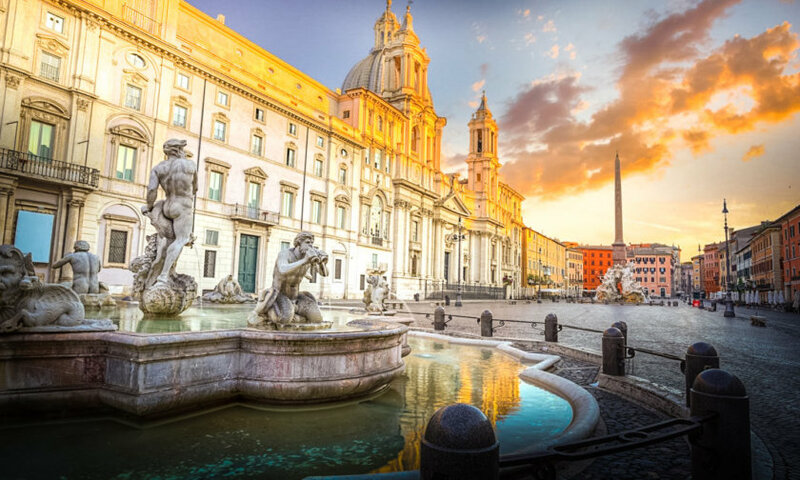 Now, it’s time to head to Piazza Navona and enter Rome Historical Center (“Centro Storico” district in Italian). After Piazza Navona, you can go to the Pantheon and the famous Trevi Fountain. After this, let’s go north, taking Via Condotti (Rome’s shopping street), it will take you directly to the Piazza di Spagna. 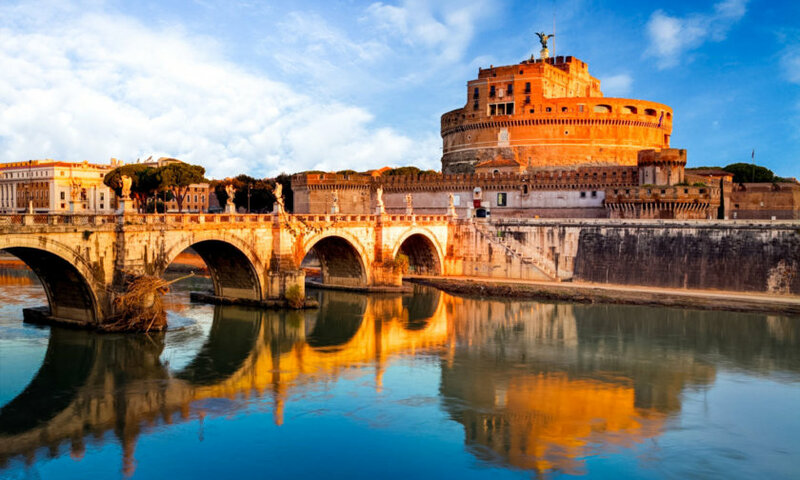 From there, go West to reach the Tiber river and walk on the quays until Sant’Angelo bridge. Cross it to arrive at Castel Sant’Angelo. For the last part of this walk, you will go to the Vatican City. Simply take the Via delle Conciliazione, it will take you directly to St Peter’s square, just in front of the superb St Peter’s Basilica. Not bad for a day in Rome, right? The type of traveler you are: you’re fast and don’t like idle times? Or do you prefer to take your time? The season of your trip: In high season, the waiting lines are much longer! It’s possible to visit Rome in 2/3 days. It’s really the ideal time to discover the italian capital main points of interest without any downtime. In this case, it’s better to plan about 4-5 days in Rome, which will allow you to explore the tourist attractions of the city at your own pace. If you only have one day, you will have to focus on one thing: The Ancient Rome or the Vatican. I give you an itinerary a bit below. Another solution for a quick visit to Rome is to only visit everything from the outside (and don’t have to wait in line!). In this case, it’s possible to see the vast majority of places described in this guide in a day. It’s nevertheless quite a run and you will have to walk relatively quickly! It’s the Itinerary I told you about in the “Getting around Rome on foot” section of this travel guide. If you don’t want to walk, another solution is to take the Hop-on Hop-off bus. Get the Omnia Card (Rome + Vatican Pass) or the new Rome City Pass. Both give you skip the line tickets for the must-see attractions of Rome! The Omnia Card also offers free public transport + rebates on 40 touristic sites in the city. Then head to the 2 other Ancient Rome touristic sites: the Roman Forum and the Palatine Hill for a great view of the city. It’s then time to go to the piazza del Campidoglio to visit the Capitoline museums. 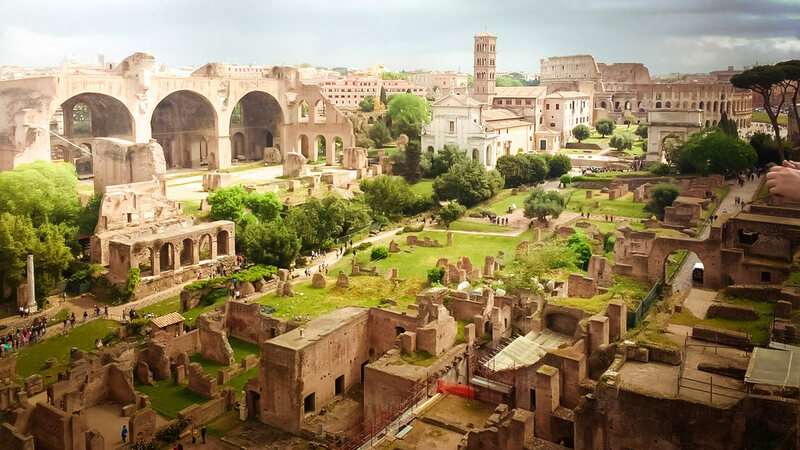 If you want to get a very good overview of the city in just 1 day (without visiting the inside of the monuments), you can also do the Itinerary I have suggested you in the “Rome on Foot” part of this travel guide. With 3 days in Rome, in addition of the 2 days above, you should now visit Rome Historic Center. head to the Piazza di Spagna. To relax at the end of the day, you should visit the Villa Borghese gardens. If you have the time (and the motivation!) You can visit one of the museums located in the gardens. Relax on the Aventine hill, enjoy the gardens and view of Rome. If you’re lucky enough to spend 5 days in Rome, I suggest you to take a day trip from Rome for the last day. From Rome – Visit Pompeii and Vesuvius: With this full day full excursion, you will discover the remains of Pompeii and go to the crater of the Vesuvius volcano. Small groups of 25 people maximum. A very enjoyable day trip from Rome! From Rome – Round-Trip shuttle service to Pompeii: If you don’t want to do a group tour nor want to drive around Rome, the best way to go to Pompeii is to take this round-trip shuttle. Departure is at 7h15 am and you will come back around 19h. You will have around 4h30 on site to visit Pompeii. 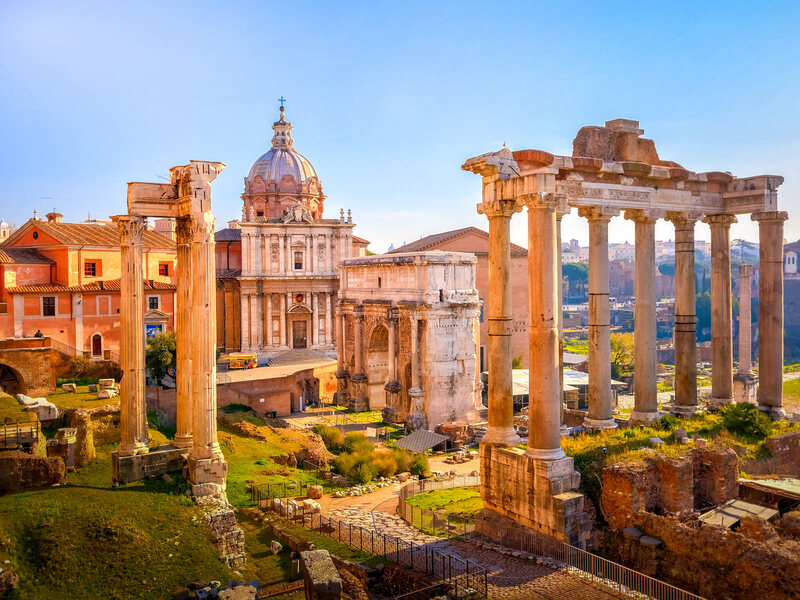 Rome – 1 day Villa D’Este and Hadrian’s Villa tour: Another option or your 5th day in Rome is to head to Tivoli to admire the 2 most impressive Renaissance villas of Italy. The guide doing the tour is very good! You’re wondering where to stay in Rome? 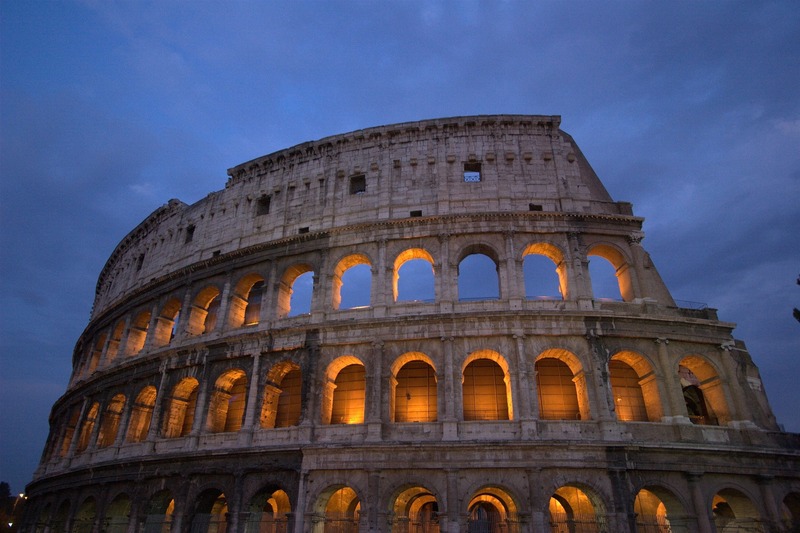 In Rome, finding accommodation at a good price isn’t that easy. In oder to help you out, I have selected for you the best hotels depending on your budget. One last advice: Book now if you can, there is a lot of demand in Rome, so the best hotels rooms are sold out very quickly! Residenza Pompino: Located close to the Vatican, simple but modern and clean. It’s the best option for a stay in Rome with a small budget. The double room is at 42 euros per night. You won’t find anything cheaper, and the location is great! Hotel Capannelle Roma: Located 10 kilometers away from the historic center. A bit far from the must-see attractions by foot, but a bus line to the center passes right next to the hotel. Spacious and bright room from 69 € per night, breakfast at 9.50 €. Strong points: quiet location, outdoor pool, varied breakfast and private parking. It’s my favorite for its great value for money! Alice Vatican House: Located 450 meters from St. Peter’s Square. Contemporary room with neat decoration from 95 € per night, breakfast included. Strong points: ideal location, terrace overlooking the Vatican, warm welcome. This is the best choice for your stay in Rome under 120 euros! Roma Luxus Hôtel: luxury hotel located at only 400 meters from Piazza Venezia. Beautiful double room starting at 200€ per night, breakfast at 20€. Strong points: The room design, the 5 stars service, the superb breakfast, the spa, the amazing staff. It’s the best hotel for a luxury stay in Rome! if you want to save a bit of money, you can find an accommodation around Rome. I recommend you he bungalows of Camping Village Rome, located at only 15 minutes by car from the Vatican city. The price starts at only 30€ per night! It’s the best “budget” solution if you don’t mind not being in the city center. It’s also a great choice for families, with the swimming pool! Getting to Rome by plane remains the easiest solution, especially since there are really cheap flights from the other European big cities with lowcost airlines like Easyjet. Moreover, the great advantage of the city is, as I said in the introduction, it’s very easy to visit on foot! So, how long would you like to stay in Rome? What do you plan to do? Where to stay in Rome? – The definitive guide of the best areas!